Stitched on printed HPI canvas. 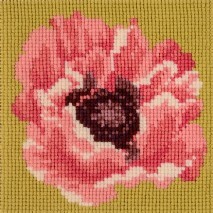 Design size is 6" x 6" on 10" x 10" canvas. 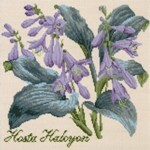 6" x 6" design printed on 10 holes to the inch blue line canvas All wools, chart, instructions and 2 needles included. Salmon pink background wool provided. 16" x 16" printed design. 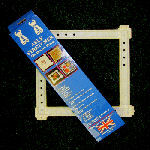 on first class E Bradley 10 holes per inch tapestry canvas .Kit includes all wools plus a marvellous colour chart and instructions to complete the design in cross stitch in wool . 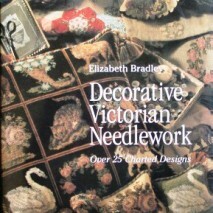 Lots more Elizabeth Bradley kits are available - if you have a particular one in mind, we can order . The Chelsea Eccentric Garden is part of the Kirk and Bradley range. Inspired by the Harrods Eccentrics Garden from the 2017 Chelsea Flower Show, the wonderfully quirky layout is a true mix of modern imagery and traditional design.The design is 14" x 18" on 18" x 22" canvas. 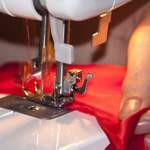 Itt is printed on 12 count mono canvas and comes complete with Elizabeth Bradley wool, and easy to follow instructions for Basketweave or Continental Tent Stitch. This kit comes on butter cream background only. See also the Chelsea Cutting Garden kit or there are lots more Elizabeth Bradley kits are available - if you have a particular one in mind, we can order . The Chelsea Yorkshire Garden is an addition to our Kirk and Bradley range. See also the Chelsea Cutting Garden or Chelsea Eccentric Garden kits. 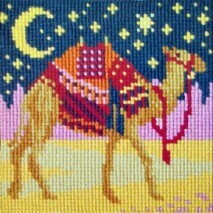 16" x 16" printed design on 10 holes to the inch canvas All wools, chart, instructions and 2 needles included. 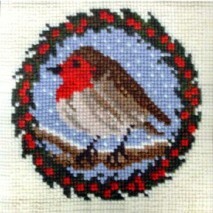 Lots more Elizabeth Bradley kits are available - if you have a particular one in mind, we can order it in for you. 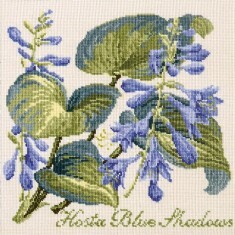 Shade Garden Collection. Cream backgound wool supplied. 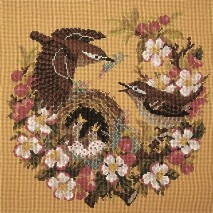 This kit features a 16" x 16" design on a 20" x 20" canvas. 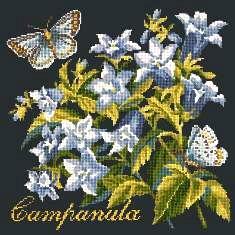 The Campanula kit comes with a chart card, printed canvas measuring 10 holes per inch, needles and Elizabeth Bradley Tapestry Wool. 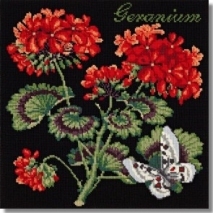 This is supplied with black background wool to give a strikingly theatrical effect. 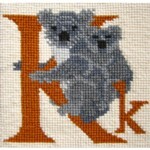 This kit features a 16" x 16" design on a 20" x 20" canvas. 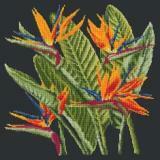 The Bird of Paradise kit comes with a chart card, printed canvas measuring 10 holes per inch, needles and Elizabeth Bradley Tapestry Wool. 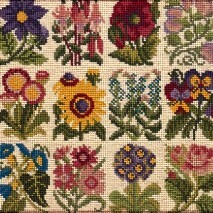 12" x 12" printed design of 12 different cottage garden flowers, on 10hpi single canvas. 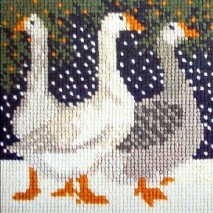 All wools, chart, instructions and needles included. Cream background wool supplied. 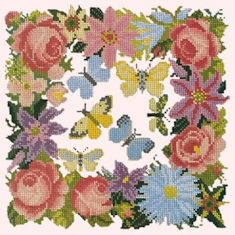 12" x 12" design of a garland of flowers with butterflies in the centre, printed on 10hpi single canvas. 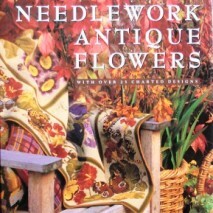 All wools, chart, instructions and needles included. CREAM background wool supplied. 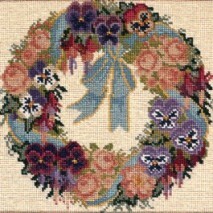 12" x 12" design. All wools included. Beautiful design of a bird's nest on an branch of apple blossom. 16" x 16" printed design on10 holes to the inch blue line canvas.. All wools, colour coded chart and needles included. Yellow background wools supplied. Beautiful design of a trio of teddy bears. 16" x 16" printed design on10 holes to the inch blue line canvas.. All wools, colour coded chart and needles included. 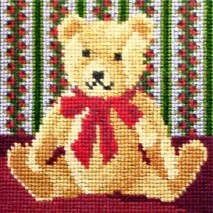 Beautiful design of a trio of teddy bearssat around a honey jar.. 16" x 16" printed design on10 holes to the inch blue line canvas.. All wools, colour coded chart and needles included. A lovely classic rocking horse on a cream background.. 16" x 16" printed design on10 holes to the inch blue line canvas.. All wools, colour coded chart and needles included. 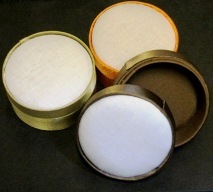 Cream background wools supplied. 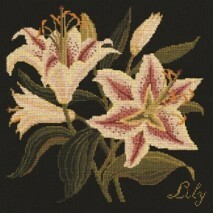 Elizabeth Bradley Tapestry Kit - Suffolk Punch and hound. A traditional picture of a bold chestnut horse and hound. 16" x 16" printed design on10 holes to the inch blue line canvas.. All wools, colour coded chart and needles included. A traditional picture of a magnificent brown and white bull 16" x 16" printed design on10 holes to the inch blue line canvas.. All wools, colour coded chart and needles included.